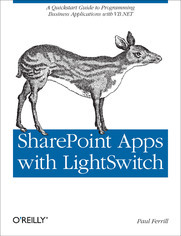 Build custom business applications for SharePoint with Visual Studio LightSwitch&#8212;including intuitive apps that don&#8217;t require a single line of code. This example-driven guide takes non-programmers step-by-step through the process of creating simple apps and utilities, and shows programmers familiar with C# or Visual Basic how to build customized applications with more functionality. Discover how to build and test your applications quickly without a lot of expensive server hardware. Once you get up to speed with LightSwitch, you&#8217;ll create quality line-of-business applications tailored to specific customer needs in no time, whether you work in-house or for a vendor.